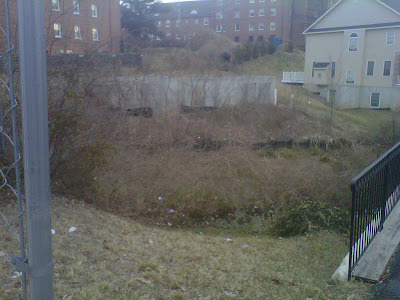 Well.... Ms V is finally getting somewhere with this vacant lot located on 38th Street SE. Since June 2009, I've been trying to get someone to address this issue. I thought I was getting close to a resolution in August 2009. 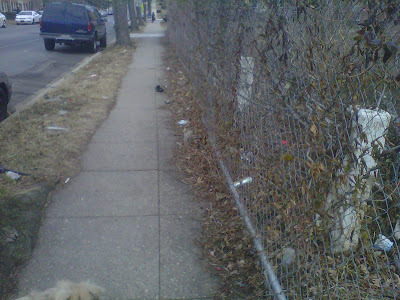 Alas here it is March 2011 and this vacant lot still is the bane of the block. a construction fence that is in the right of way.... Note: there is no sidewalk on the other side of the street. One of the biggest issues related to getting assistance is providing a street address. The developer didn't subdivide the lot, so it was associated with 3802 Suitland Road. However, recently the developer must have divided the lot, because now I have an address (2250 38th St SE). This gives Ms V a glimmer of hope. Unfortunately, I learned from DCRA that the developer can leave just the foundation as long as it isn't deemed dangerous. Le Boo..... On the bright side, I put in a request to DPW to have the tree overgrowth and the debris removed from the lot. As of this weekend there were liquor bottles galore, car windshields, and who knows what else down in the creek. In addition, I requested DDOT to investigate moving the construction fence so pedestrians can comfortably walk down the sidewalk. Ms V is keeping hope alive. Keep pounding on them. Fines build up! Those houses are going to flood big time. When we have a super gully washer, go out to the playground and watch where the water goes. 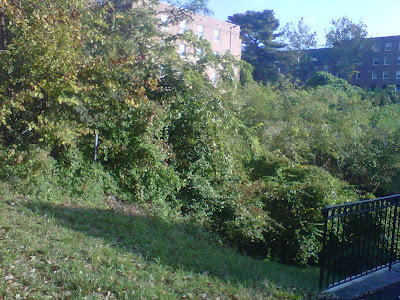 That back sidewalk becomes a big creek downhill from Village 1 to the tennis court area.